All this talk of space games got me itching, EVE is a point and click space game and I dont have any interest in it. Elite: Dangerous is looking good. 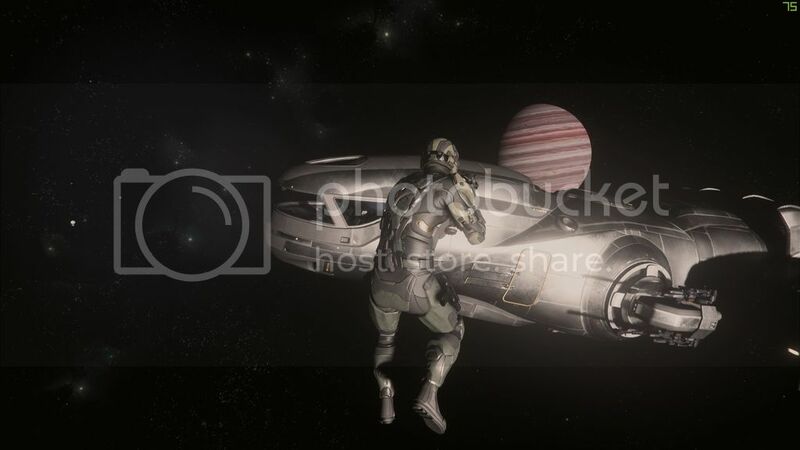 Star Citizen has anybody been playing it? I seem to remember some talk of it a year or so ago but since then nothing. I popped over at the web site and looked trough the facts but nothing on what controllers can be used. I am just looking for some input on the game and the subscription packages they offer. I can't play it. Something with the installer. Customer support doesnt seem to care my tickets. $40 down the drain so far. Sounds promizing. EVE is a sci-fi spreadsheet simulator... Elite Dangerous is a released game, very impressive and immense in scale. So immense that it would be impossible to explore the whole game in one lifetime. Star Citizen is not nearly finished yet. There's a dogfight simulator out, and that's about it, but it looks great and I have no doubt the end result will be noting short of amazing. No gods or kings. Only Predator. I have Elite and I will get Star Citizen. Like you, no interest in EVE whatsoever. Elite costs £40 ($60) and there is no subscription fee. Two or so expansions are planned bringing character movement about ships, stations and planets. Costs for those have not been announced. Star Citizen is still in fund raising mode to sustain its development. I don't know if the final financial model has been determined. Have faith frenchy. I got it working a week ago. I've got multiple Star Citizen ships but only two are in the Dogfighting Module right now. And as its an alpha, they frequently destroy any semblance of balance in the game. Right now missiles are super deadly and make the game super not-fun. I'm not upset, they're pushing boundaries to see if they can find a balance point no one has thought of before. You can't judge it like a game that's actually released. Also you can't expect to be a high maintenance customer and play the alpha. You have to solve your own problems and submit bug reports, not expect a perfectly-working game or personal attention from a large help desk. That will come later. Its disappointing to see people like Frenchy say "$40 wasted", because the game is in alpha. Or pre-alpha, depending on your definition of what alpha is. You paid for a finished game that will be out in 2016, what you're getting now is a bonus and you're not entitled to it for your $40. I plan on playing Elite:Dangerous once I hit some milestones in Planetside 2. Pretty much decided that I'm going to do it, but need another month or two. This is the Captain. We have a lil' problem with our entry sequence so we may experience some slight turbulence and then... explode. Microsoft Visual C++ 2010 64 newer version installed, please fix the issue. Then I have a EKC3.220.DLL not found and the game launcher keeps on looping repeating the same error. Their answer was 'please describe the problem'. ... which I repeated but no more coms after that. I did a google search for "EKC3.220.DLL not found star citizen". It said "Did you mean: EKC 3.220.DLL not found star citizen". I clicked that link. At least try to be a low-maintenance player. The game is in pre-alpha. I would try Elite, but I hate their business model. I am not willing to shell out 60$ on a game where judging from the last 50 games I tried, will have 90% chance that I will uninstall after 3 hours of playing. Mosquito VI - twice the spitfire, four times the ENY. Click!>> "So, you want to fly the wooden wonder" - <<click! the almost incomplete and not entirely inaccurate guide to the AH Mosquito. Waiting for the 3.5 flight model work to be done before I really dedicate any time to Star Citizen. I have a nice ship collection in the Hangar though . Right now Star Citizen has some pretty cool sandbox play and is being used to make some really cool machinima. And these videos are continuously made by the community, those 3 all came out in the past 2-3 weeks. I usually buy my games only when they are on a sale, and did so with Elite as well. You could also just buy the basic Elite first to get a taste, and only upgrade to the Horizons expansion if you like what you see. Oh, and if you buy on steam, you always have the option of getting a refund if you haven't played more than two hours.